This is a perfect drink for kicking back and relaxing during the holidays - soothing, chocolatey and belly-warming with a shot of caffeine to revive you for the next round of gift-wrapping, holiday shopping or kid wrangling. 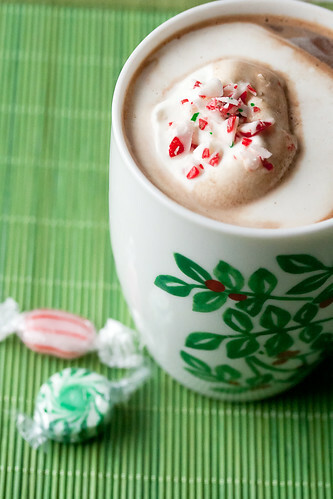 For the kidlets, simply omit the espresso and you've got yourself a Candy Cane Hot Chocolate instead. In a small saucepan set over medium-high heat, bring sugar and water to a boil. Reduce heat to low, then stir in peppermint extract and simmer for 20 minutes. Remove from heat and allow to cool before transferring to a container. Syrup will keep for several weeks in the refrigerator. In a small saucepan set over medium-high heat, whisk together milk, cream and sugar until the mixture reaches a simmer. Remove from heat immediately. Add chopped chocolate, cocoa powder, espresso and ¼ cup of peppermint syrup, and whisk until smooth. To serve, divide the hot mocha evenly between four cups, then garnish as desired.